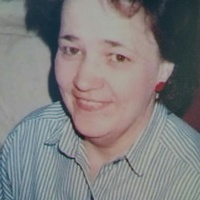 Charlotte Marie Jackson, age 75, went to her heavenly home on January 16, 2019. She was born September 21, 1943 to Edward and Clara Boston. Charlotte retired from The Oklahoma School for the Blind where she worked as a Direct Care Specialist, a job she enjoyed very much. Charlotte enjoyed going out to eat with family, giving her brother Bobbie a hard time, spending time with her granddaughters, Addi and Emmy, visiting with close friends, watching her cooking shows, Property Brothers and never missed watching Nascar races or when her favorite team the Oklahoma City Thunder was playing on television. Charlotte will be remembered for her great sense of humor, how she listened with an open mind and heart, her encouraging words and the love she had for her family and friends. Charlotte is preceded in death by her parents, Edward and Clara Boston and her sister, Judy Hanson. Charlotte is survived by her sons, Mark Jackson and wife, Linda, Brian Jackson, Ronnie Jackson and wife, Tina and Tommy Jackson, her grandchildren, Wade Jackson and fiancé, Lindsey, Christin Storm and husband, Justin, great grandchildren, Addisyn and Emery Storm, her brothers, Bobbie Boston, Perry Boston and wife, Sherry, niece, Denise Dunn and husband, Danny, nephew, Damon and wife, Malinda, great nieces and nephews, Parker, Gracie, Curtis, Lahna, Cameron, Myanah, and Cody. Along with a host of other nieces, nephews, cousins and friends. Charlotte was loved by many and will be truly missed. A special thank you to Valerie who was not only her provider and took great care of Charlotte, but was a greatly loved friend. A Memorial Service is scheduled, Wednesday, January 23, 2019, 11:00 a.m., Mountain View Baptist Church, 6401 W. Hancock Road, Muskogee, OK; with Gary McElmurry, officiating.